Here’s why this painting is called Ave Maria. It is a reimagining of the nativity set in a rundown corner of the inter-city. The use of sacred imagery in an urban setting is meant for you to draw comparisons. It is harder to dismiss the presumed Mother of God as being insignificant or worth less than more fortunate people. 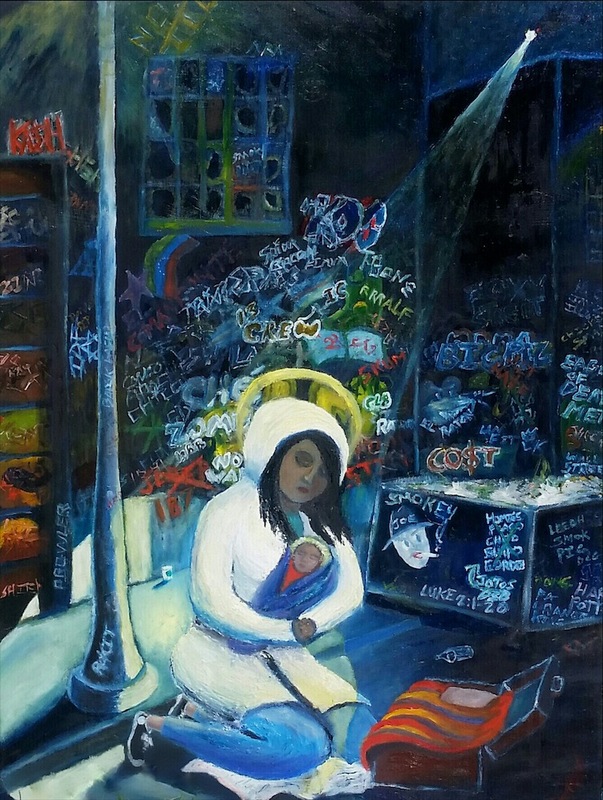 This piece speaks to the plight of poor homeless women, considerations of single motherhood, the possibility of flight from domestic violence, isolation, and/or the plight of immigrants. The image reminds us that finding “no room at the inn” is a reality faced by many people, and all too often by women and children. They are faced with life on the street and not by their own choice. While not exclusively a political statement, the Virgin Mother as a Latina female, enduring hardship yet maintaining a mother’s grace, challenges us to acknowledge her humanity. It suggests compassion has no boundaries. It is a relatable image, not a celestial virgin crowned with gold, but a real human being struggling with poverty and separateness. Finally, use of graffiti as a backdrop is meant to provide the setting with color and subtle messages within the image. The graffiti also provides a possible secular interpretation, suggesting her apparent halo, is simply a reflection of wall paint. The uncertainty of her sanctity creates more room for broader interpretation. Ultimately the meaning of the art is what the beholder makes of it, and even the artist’s interpretation is not the final word. This piece has so much emotion. It’s hard to fathom anyone having to endure such hardship and trauma. Even in this world today it is abundantly overwhelming with sadness. The richness of deep color shows where there is fear of lost hope yearning for recognition of acceptance. I am enjoying the posts on Paloma Negra. Please continue sending your comments and blogs. I am inspired by your suggestions on creativity. Learning a lot. And although I am a musician and music teacher this is still about integrating the arts. Its all about expression of the soul. I own a couple of your paintings Irene and love them every day. Darrell it was my pleasure and Tony’s too! Thelma, it’s been years since we’ve communicated. Please refresh my memory about which paintings you have. Your feedback is so encouraging and accurate. It IS about expression, be it music, or art, or drama. We appreciate your kind words very much and will continue to send you blog posts and info on courses.